COMMUNITY HAUNTED HOUSE 2018 - HALLOWEEN ON THE BLACK PEARL! The cast and crew of the Black Pearl would like to thank everyone who set sail with us this Halloween season at our Community Haunted House- “Halloween on the Black Pearl”. We had an amazing voyage with all of you. who provide funding to put this event on each year. helped with all of the set up and construction of the Haunted House again this year. 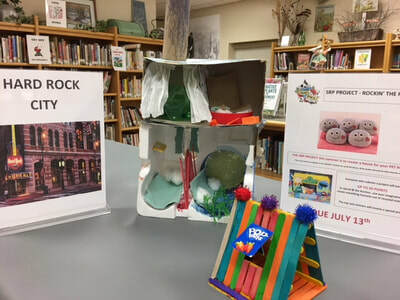 SRP (Summer Reading Program 2018 - LIBRARIES ROCK! We'll be traveling through space with ROCK-ets, twisting in our poodle skirts during the 50's, and dressing in our best hippie attire during this summer's program. Mike Riesch from Earthaven will be here with his ROCKS, and all who register will get a PET ROCK to take home and nurture. As in past years, the kids earn points for all the reading that they do and for all of the projects that they complete and they turn their points in for prizes @ the SRP Auction. Our library worked again with Hillside Assembly and St. John's Lutheran to bring the EASTER BUNNY to Gillett! There were games and activities while waiting for the HUNT to begin, and all went through the CANDY LANE after the EGG HUNT! Thanks to the Gillett Fire Department who hauled and spread water and to the Gillett City crew who plowed the snow and created the banks around the rink, the Skating Rink opened on January 4th, 2018! 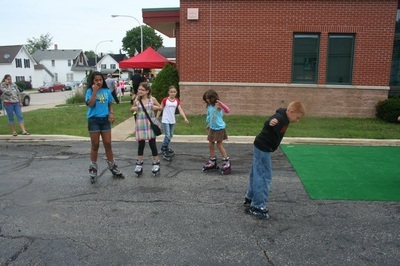 It's been busy after school every day, and there have been a lot of first-time skaters. We have over 60 pair of ice skates that we can loan out (using your library card), and we have a large variety of sizes from small double-bladed skates to hockey skates. 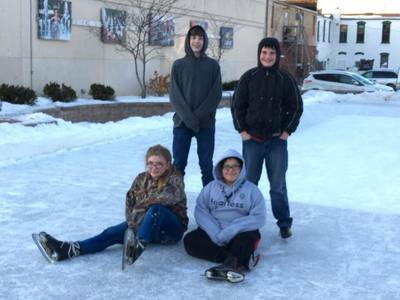 COME TO SKATE THE SQUARE THIS WINTER @ THE GPL! We had a phenomenal cast of characters for this year's HALLOWEEN @ HOGWARTS Haunted House! So many volunteers made this community event a great one for all of the over 400 visitors that came to see us. Not pictured are: Lynn J (tickets), Kathy E (Hedwig), and Gary Jaeger (Gary and Kay created the Haunted House again this year). We're already planning for next year, and we all can't wait to entertain you once again at the Community Haunted House @ the Gillett Library. 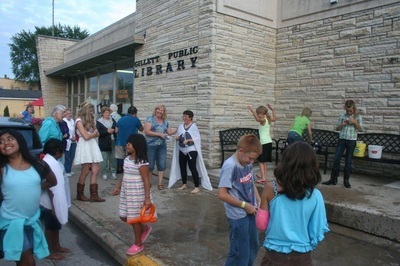 This was the second year that the Gillett Public Library created a Haunted House inside the Gillett Library Community Center facility, and it was a Grimm's Fairy Tale theme. The Haunted House was open the last two weekends in October. House visitors were able to wait inside the library for their house tour to begin this year, and were entertained with stories by the library's new fireplace. A "Lumberjack" led them through the woods that were created in the Community Square, and the Grimm met them inside the house and led them on a tour. Each room in the Haunted House was decorated for one of the Grimm's Fairy Tales...there was a pond set up for the Frog Prince, mirrored walls in the room where evil Queen Raveena (from Snow White) was waiting, and a large bed was on display in the Princess and the Pea's room. Kay Rankel (library director) and Gary Jaeger (from the Friends of the Gillett Library) worked hard to get the House decorated this year and are already talking about the plans for next year. There was a large cast of characters, all volunteers, and they all did a great job...it was a wonderful event for the community! 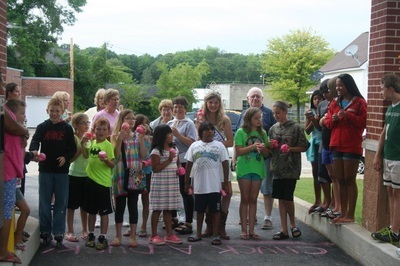 We celebrated the completion of the new library space and the new Community Square on this day, and acknowledged the Ebenreiter family for making this project possible. Merrill (from Mad Dog & Merrill) was here doing grilling demonstrations featuring fall foods. There was also and Art/Craft show along with Hums Faith alpacas. Lots of fall family activities, food, and fun! Thanks to everyone who came to send off Miss Cindy. There was a contest to see who could do the best job imitating Miss C (won by Gary J), a parade down Main Street (many wore their underwear on the outside to honor Miss C who is known by the community as Captain Underpants), Mayor Irene Drake gave her the Key to the City, and Miss Cindy told one last story and made balloon animals for the kids before the day ended. She performed one last magic trick too, and passed the torch to new children's librarian Miss Jodie. Many came to wish her well and tell their favorite stories. Thanks also to all the volunteers who helped with this party and to those who supplied pictures. Thanks for the memories Miss Cindy! MISS CINDY LED THE WAY DOWN MAIN STREET WITH ALL FOLLOWING BEHIND, MANY WEARING THEIR UNDERWEAR ON THE OUTSIDE TO HONOR HER! COMMUNITY SQUARE OPEN HOUSE EVENT sponsored by "OUTSIDE THE BOX"
Our library received a grant for thinking "Outside the Box"! 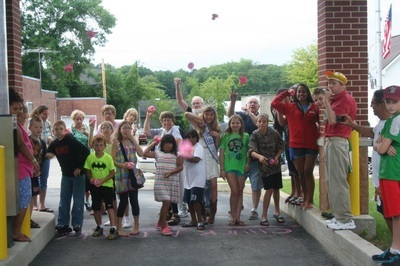 This grant was sponsored by Redbox, the Project for Public Spaces and OCLC for the purpose of creating an outdoor community event. We were one of 22 libraries/library systems in the US that received this grant opportunity. 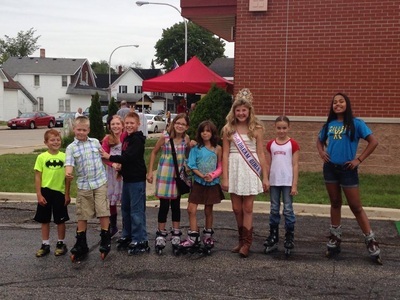 The Open House started with a Back-to-School Fashion Show emceed by local celebrity Ashley Rose who won the National Junior Teen Miss pageant. Thurmont Ridge entertained everyone with live music. 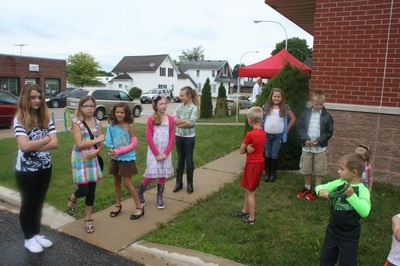 The Gillett Civic Club donated the grilled food, St. John's Lutheran Church provided the popcorn and lemonade, Rank's Northern Distributing and the Gillett Lion's Club provided the ice cream. Despite the modifications we had to make due to weather, it was a great event. Hopefully this is the first of many events to take place in this new Community Center/Square space. Thanks to everyone who supported this event! Miss Kay and Miss Cindy did the ALS Ice Bucket Challenge at the end of the evening, challenging all Oconto County librarians to do the same! We were lucky to have him here at the beginning of his new book tour for "Visiting Tom". BOOM! For more information on Mike and book tour schedule, visit his website at sneezingcow.com. "Visiting Tom" is an Amazon.com Editors Pick of the Month and is #21 on the New York Times Book Review for hardcover nonfiction!! !